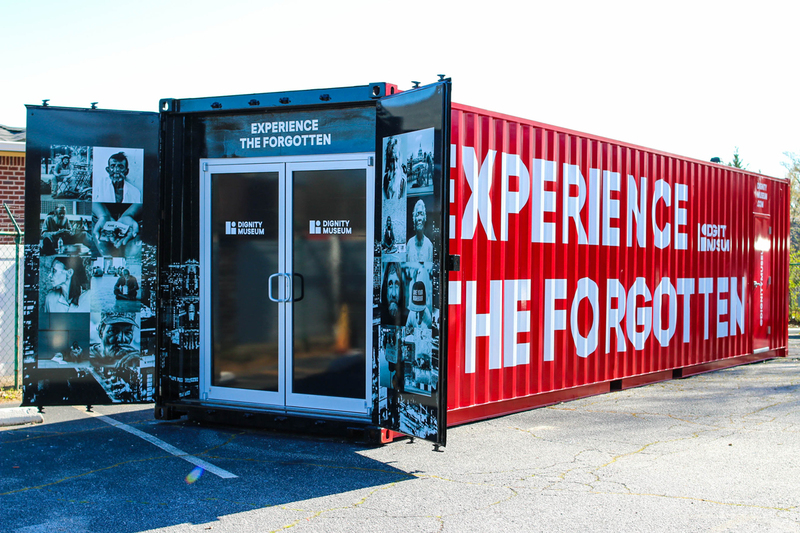 The Dignity Museum is housed in a shipping container at LoveBeyondWalls’s headquarters in College Park. 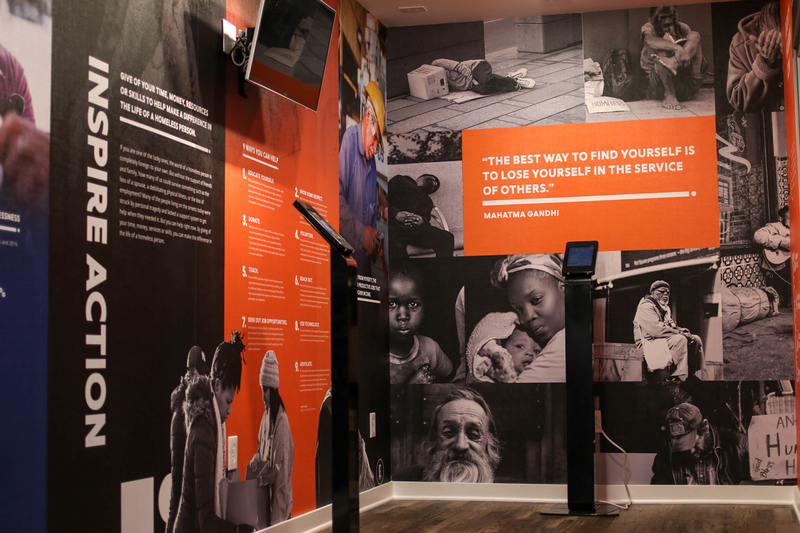 The Dignity Museum, an exhibition that focuses on the challenges and bias of homelessness, officially opened this past Saturday in a bright red shipping container at the College Park headquarters of nonprofit LoveBeyondWalls. 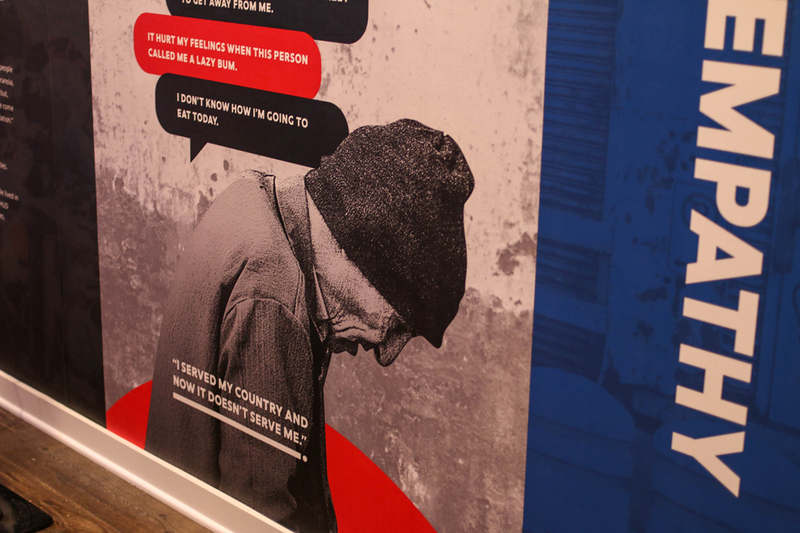 For the nonprofit’s founder Terence Lester, who curated the exhibition, homelessness is not only a social issue he’s been working on for years, but something he experienced himself as a teenager. 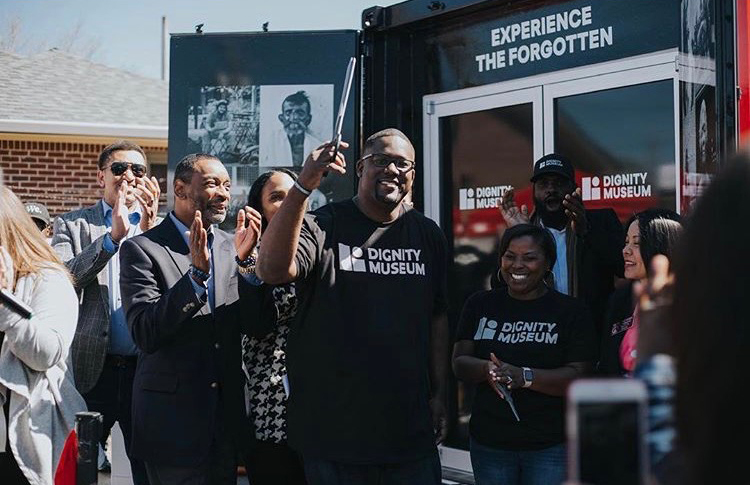 Lester (center) opens the Dignity Museum. When Lester was younger, he decided to leave his home and drop out of school due to family hardships. As he was walking out of his school on that last day, a homeless man approached him and started talking to him. During that short conversation, he told Lester to stay in school and not be like him. “That was the first time I heard someone tell me that I would be a leader. I stopped going to school for a moment and lived in parks, but that conversation never left me and was always in the back of my mind,” says Lester. He eventually went back to school and remained close to the cause of homelessness, continuing to donate clothes and funds to support Atlanta’s homeless population. 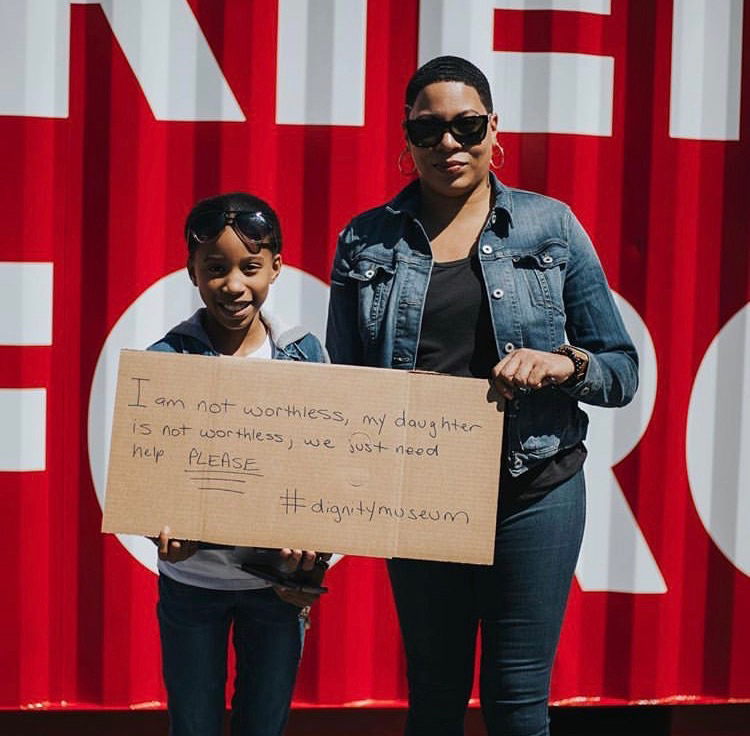 According to homeless-focused organization Atlanta Mission, there are 7,000 homeless people in the city of Atlanta, including individual adults and families with children. 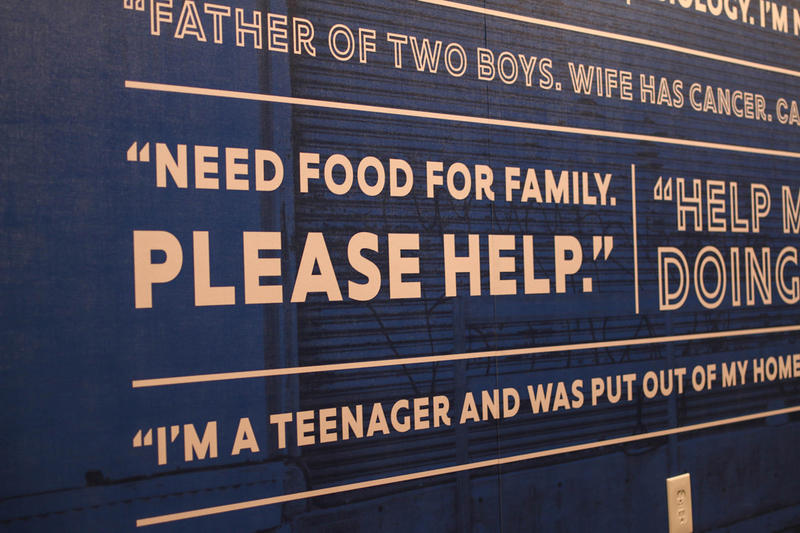 To understand first-hand the issues the homeless community experiences every day, including food sourcing, housing, and hygiene, Lester lived on the streets with them for a few weeks in 2013. Shortly after, he decided to found LoveBeyondWalls to raise awareness and help meet the needs of the local homeless population through resources such as mobile grooming stations, temporary shelters, and grocery programs. To date, Lester says, LoveBeyondWalls has provided resources for nearly 100,000 people in the city and clocked more than 25,000 volunteer hours. For the Dignity Museum, Lester explains, the shipping container location is meant to act as a metaphor for people experiencing homelessness. “We chose shipping containers because these containers travel around from place to place. Every shipping container has a story, and every shipping container carries something of value. Homeless people move around from place to place, but it does not mean that they don’t have value,” says Lester. The museum makes the most out of a small space by incorporating technology such as virtual reality headsets, a smartphone app, and interactive iPad stations to immerse the visitor in the experience. The museum also provides cell phones at the beginning for guests to scan QR codes and explore more stories within the space. “It’s a combination of art and technology. We wanted to use technology to create an immersion where you forget your own thoughts and judgement. 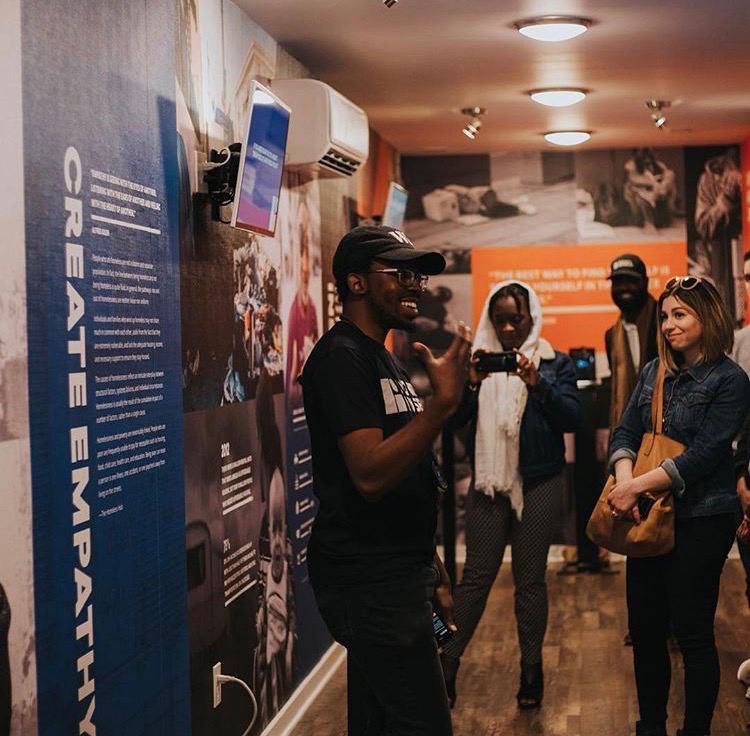 It creates a classroom-setting where people can learn from individuals that they probably wouldn’t get a chance to learn from,” says Lester.The exhibition had more than 300 guests stop by for its opening reception this past weekend and will remain at LoveBeyondWalls for the next few weeks. Lester is already in talks with local schools and businesses to bring the container on-site for educational purposes, and he’s already thinking up of ways to do pop-ups around the city through partnerships with nearby museums. “We want to inspire [visitors] to create more time and space to serve with organizations that are on the ground or donate toward our efforts,” he says.